An additive peanut butter cookie, stuffed with peanut butter cups. This version is naturally sweetened and grain-free! Preheat the oven to 350ºF and grease a mini muffin pan with coconut oil. In a large bowl, stir together the ground chia seeds and water to make a "chia egg." It will gel together and thicken as you measure out the peanut butter. To the chia egg, add in the peanut butter, coconut sugar, vanilla, baking soda and sea salt and mix to form a thick batter. Stir in the vinegar last, which will react with the baking soda to help the cookies rise. Use a tablespoon to drop the batter into each mini muffin well. I like to use a cookie scoop like this so that all of the cookies have the same about of batter. Bake at 350ºF until the cookies rise and are lightly golden on top, about 10 to 12 minutes. While the cookies are baking, remove the peanut butter cups from their wrappers. This recipe is time sensitive so it's imperative that you are ready to insert the peanut butter cups the moment the cookies come out of the oven. 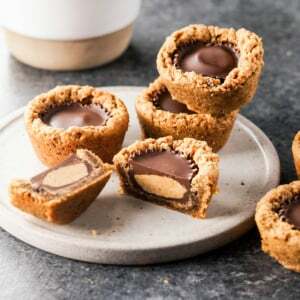 As soon as the cookies are done, immediately press a peanut butter cup into the center of each one. The cookies should be soft enough in the center that they are easily pressed into. Once all of the peanut butter cups have been inserted into the cookies, allow the cookies to cool completely. Once cool, use a knife to remove each cookie, sliding the knife around the edge of each cookie to loosen them up. They will be fragile if still warm at all. Austin and I actually prefer these cookies cold, so I place them on a plate and keep them in the fridge to serve. Store them in an airtight container in the fridge for up to a week, or in the freezer for up to 3 months.